Comfortable living environment is of great importance to our health. If you want to buy a humidifier for improving living condition, this ultrasonic air humidifier is your choice! This humidifier features 2.2L capacity, ensuring quite a long working time. Low-voltage power supply, energy-saving and eco-friendly. 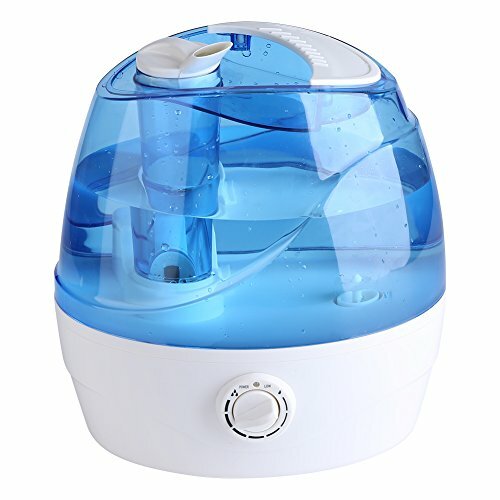 This humidifier could keep you away from dry air, so that you will effectively avoid of suffering from disease of discomfort. Product Height: Approx. 24cm / 9.4"
【Super Quiet and Safety Guarantee】Our air humidifier is extremely quiet. It can moisturize the air to relieve stress and create comfortable atmosphere.It helps breathe better and improve the quality of sleep. 【Automatic Shut-Off】Indicator light changes color when water tank is empty. Certified Safe to use as the automatic shut off safely turns the Humidifier off if the water level is low or if the water tank is removed. 【Function】Disperses fine mist, keep the air moist and produce rich negative oxygen ion to help protect your skin. It can relieve nervous tension, eliminate fatigue, and have special effects on indoor air pollution. 【Easy and Convenient to Use】Easy to adjust mist outlets, allow narrow or wide mist output. Automatic humidity balance.To set your desired humidity level, conveniently adjust the amount of mist flow by turning the dial knob. It will give out cool and smooth mist, softening and moistening dry and chapped skin. 【Application】SPA, yoga, bedroom, living room, meeting room, office, baby rooms, hotels, hospitals or other private/public spaces.